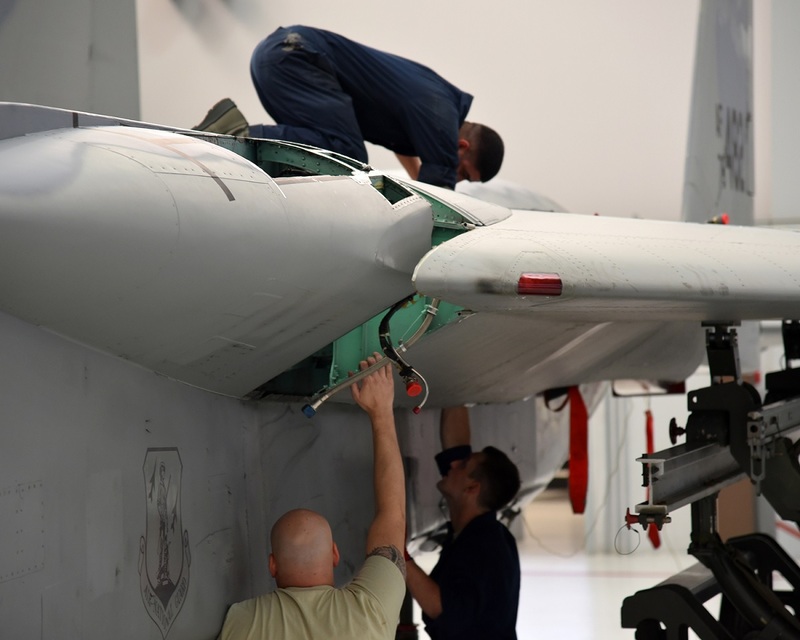 The Depot Field Team from the 402nd Aircraft Maintenance Group, Robins Air Force Base, Ga., move the new wing into place during the wing replacement of F-15C Eagle 78-482, assigned to the 142nd Fighter Wing, Portland Air National Guard Base, Ore..
A normal F-15C wing change can take 10 to 12 work days. The Depot Field Team performed this change in seven days. As told by Senior Master Sgt. Shelly Davison, from 142nd Fighter Wing in the article F-15 Eagle gets a new wing for the New Year, for members of the 142nd Maintenance Group’s Non Destructive Laboratory (NDI) shop, performing Individual Aircraft Tracking (IAT) inspections keeps the F-15C fleet at the top of their game. Depending on the determined life expectancy of specific parts, inspections are scheduled on an hourly and/or calendar basis. When an IAT inspection is performed, it is tracked, documented, and a determination is made regarding the next inspection period. If a crack is discovered, the location and orientation is determined, the information is then sent to Robins Air Force Base engineering to provide a disposition regarding repairs that might be required. In some cases engineers recommend monitoring the defect rather than repairing. This was not the case for the 142nd Fighter Wing’s F-15C Eagle, Aircraft 78-0482, she required a new wing. The Depot Field Team from the 402nd Aircraft Maintenance Group, Robins Air Force Base, Ga., removes the old wing from an F-15C Eagle assigned to the 142nd Fighter Wing, Portland Air National Guard Base, Ore., Dec. 6, 2016. 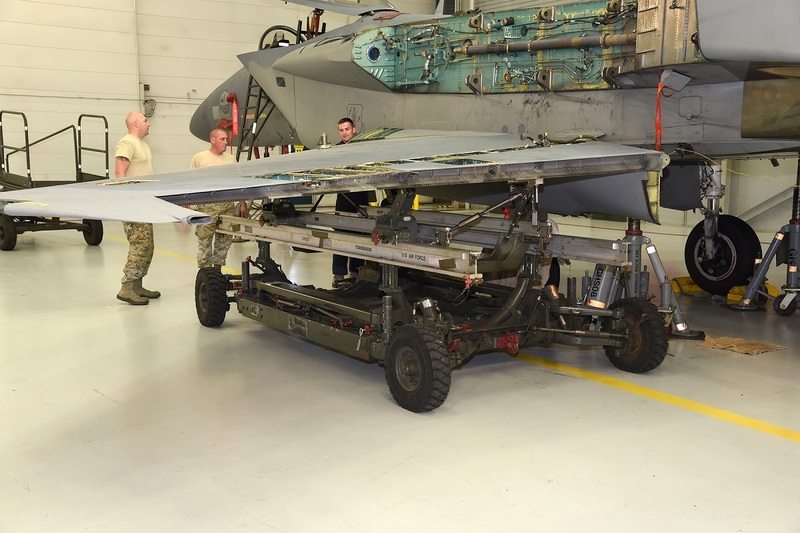 Immediately the 142nd Maintenance Squadron Structural shop worked with the engineering disposition and with Robins Air Force Base engineers to come up with a replacement plan. 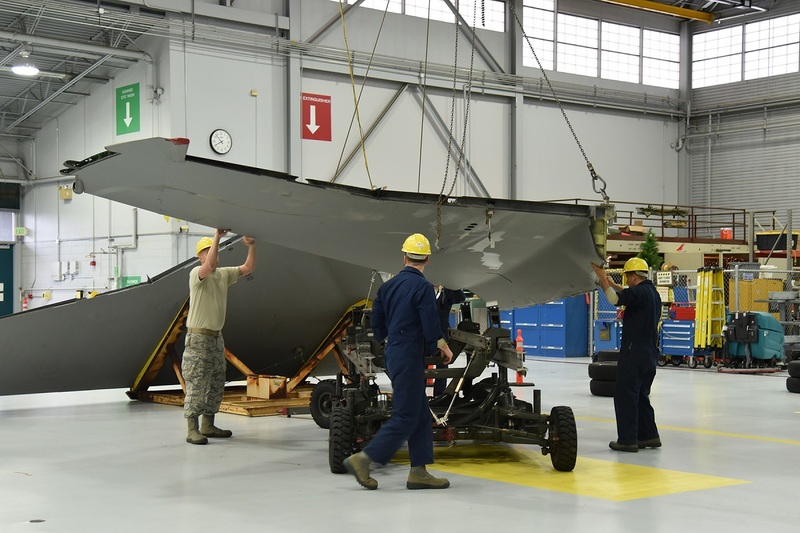 Several members of the 142nd Maintenance Group including crew chiefs and back shop specialists immediately got to work, and prepared the wing to be removed prior to the arrival of the DFT, who would be performing the swap. The DFT from the 402nd Aircraft Maintenance Group, Robins Air Force Base, Ga., arrived in record time with the new wing and seven mechanics, consisting of crew chiefs, aircraft sheet metal, aircraft fuel system, and aircraft electrical/environmental system specialists. The Depot Field Team from the 402nd Aircraft Maintenance Group, Robins Air Force Base, Ga., remove the wing from an F-15C Eagle assigned to the 142nd Fighter Wing, Portland Air National Guard Base, Ore., Dec. 6, 2016. 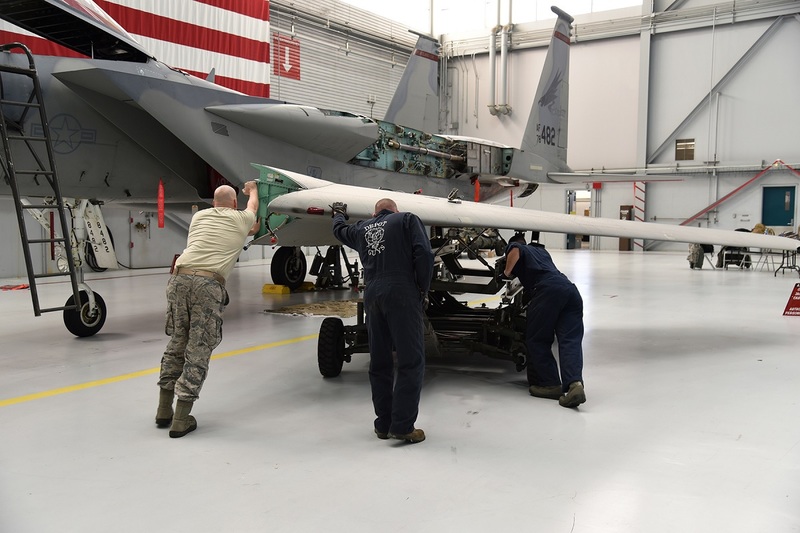 The mission of the 402nd Aircraft Maintenance Group is to provide Programmed Depot Maintenance and unscheduled repair activities on F-15, C-130, C-5 and C-17 aircraft. They are responsible for the repair, modification, reclamation and rework of more than 200 aircraft worldwide. In addition, they prepare and deploy combat Aircraft Battle Damage Repair, crash recovery, supply and transportation teams worldwide. “It was remarkable how quickly depot was able to get a replacement wing and DFT to us, especially considering the holiday season. On the first day of the team arrival, the wing was off and on the second day the new wing was on,” Lantagne stated. A normal F-15C wing change can take 10 to 12 work days. The DFT performed this change in seven days, cutting the aircraft down-time by at least three days and reducing man-hours from 672 hours to 528 hours. 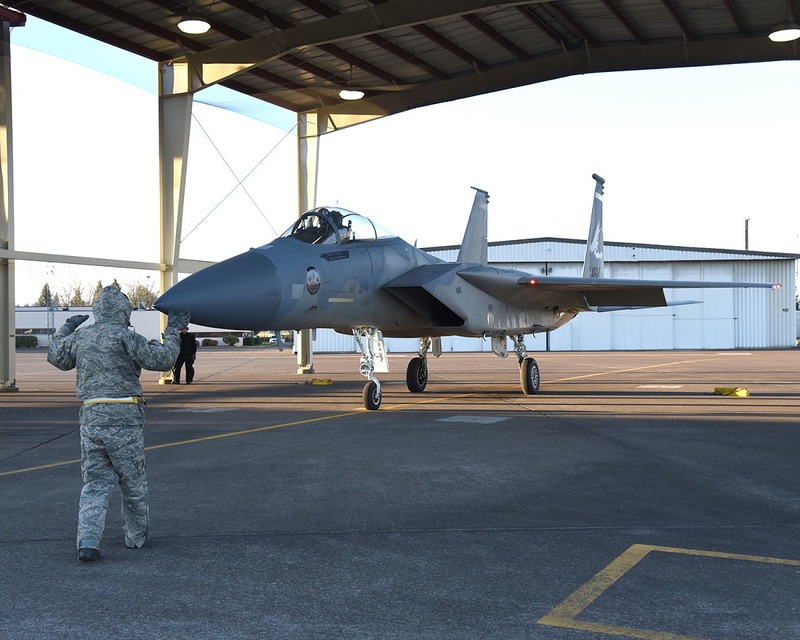 The Depot Field Team from the 402nd Aircraft Maintenance Group, Robins Air Force Base, Ga., attaches a new wing to F-15C Eagle 78-482, assigned to the 142nd Fighter Wing, Portland Air National Guard Base, Ore.. Crew Chief, Master Sgt. Mark Billmyer, 142nd Aircraft Maintenance Squadron, marshals F-15C Eagle 78-482 for its first launch with a new wing, Portland Air National Guard Base, Ore., Jan. 3, 2017.